Brooklyn, New York meets Como, Mississippi in this treasure of auditory bliss. I’ve been worshipping this record for months now. Fresh off one of my many jaunts Southbound, this time in and around Como, Mississippi for visits to two of my favorite musicians final resting places, that of the great R.L. Burnside and Mississippi Fred McDowell. 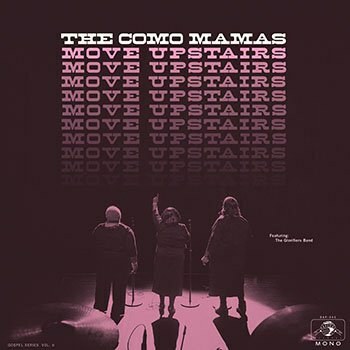 The latest offering from the enigmatic Daptone family, Move Upstairs, by the incomparable trio of gospel singers, the Como Mamas, played its part as the intrinsic soundtrack of my travels. The Como Mamas are a spectacle sans even musical accompaniment as evident on “Glory Glory Hallelujah”. The power of the natural singing voices of Ester Mae Smith’s rasp and sisters, Angelia Taylor and Della Daniels’ custom croon is bountiful and beautiful, breathtaking and deservedly being laid to vinyl and compact disc for all to devour for ages. The record is lightly and tastefully backed by the common cast of crack musicians at Daptone Headquarters, this time heralded as the Glorifiers Band and featuring the guitar prowess of Thomas Brenneck, label owner Gabriel Roth’s alter ego Bosco Mann’s loose and groovy basslines, Homer Steinweiss’ drum kit and percussion, and of course Jimmy Hill’s organ keys. These are the voices of angels, raised and honed in the church in the humid homogeny of Mississippi -- their vocal strength a product of worship and praise, belief, and resilience, love, and epiphany. From the Mama’s opening vocal bars of the title track and the driving come oscillating back beat of the Glorifiers, they own your heart and soul for the next ten tracks of praise. Whether armed with boogie shuffles, acapella, or a sweaty trap slap and bassline, Move Upstairs is a track stopper, questioning your beliefs or lack thereof, and whether you’ve even been worshipping right all this time even of you are a devout Christian. I’m not a church-goer, but I hold records like this as my ‘church’. Pull out a 12-inch cylindrical piece of plastic, delicately place it on a turntable platter, slip mat or otherwise, digest the first few sonic crackles as a taking of offering and allow this record to leave one Sunday schooled. It’s not so much belief in God or whatever it is one may pray to as much as it is a celebration thereof. Grasp your higher power and raise it up in worship or just nod a head to an irresistible groove and a trilogy of arguably the best voices in the world today. I was weary in hearing that they tracked this with the Mama’s in NYC at Daptone’s studio, fearful that they may come across as out of their ‘element’. An applause to Daptone and the Glorifiers Band for such tasteful production and staying sparse when needed. Less is more especially when it’s the rawest of human instruments at the forefront. The Mamas are their element, so rich in their trade that they can most likely make a record on the moon and it would shine like the sun. The world needs more of the Como Mamas and their funky gospel offerings.